Last time we discussed how innovative culture represents the most important force behind modern business success, which drives innovation in both technology and the business model that applies such technology. We dived into the concept of agile and agile thinking being the essential ingredient for building an innovative culture. We compared agile culture and its underlying value beliefs and how they influence the ‘way of work’ for different organisations. In the context of risk management, the differences in this culture undertone, shared values and the way of work have profound implication to the risks faced by the organisation and how these risks can be best managed. Let’s explore this using project management as a relatively straightforward example. Maybe I should rename this post to – ‘how to deal with the inevitable agile disruption? How an organisation runs and manages its projects says a lot about itself. All projects are subject to constraints within the boundaries of the ‘way of work’ because they must work in tandem with resources already committed – people, funding, processes, priorities, inter-dependencies and timing. An established companies usually run projects within a clear structure of teams, roles and responsibilities, reporting lines, handoff points and decision making regime. 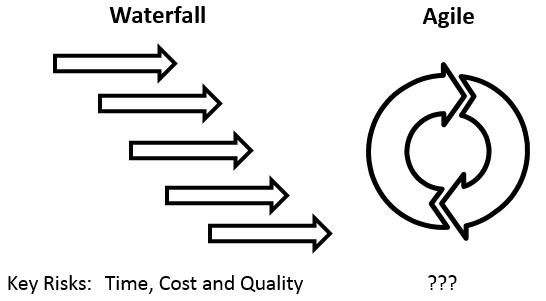 Embedded within a formalised PMO, traditional project risk management fits into this linear project lifecycle (usually waterfall) and is anchored by clear action points (or management controls) at key milestone stages such as qualitative and quantitative risk assessment, management review and approval points. Comparatively in a start-up agile environment, project management is turned on its head. Team are mostly cross functional with significant autonomy in deciding what and how to deliver a product or value. Non-value adding activities such as process maps and progress report are considered ‘waste’ because constant progress will render them outdated by the time they are created. Evolved from project management, the agile thinking has been dubbed as the single most fundamental feature for most of the modern successful tech companies. In advanced agile organisations, agile way of working extends beyond project management and becomes ‘the norm’ and ‘business as usual’ reinforced by people initiatives on trust, learning, innovation, sharing and value. I have seen organisations continuously deliver products or values in squads, tribes and guilds without formal reporting lines or delegation authority. The key risks addressed by traditional project risk management – time, cost and quality – are significantly mitigated simply by the approach advocated by agile philosophy – Agile teams can start with a simple user story to build a minimum viable product deployed into production through short and iterative sprints dotted with regular feedback loops. Agile practitioners will know that I had omitted a whole lot of other enablers, pre-requisites and tools of agile practice. For more details, refer to here, here, here, here, and here. 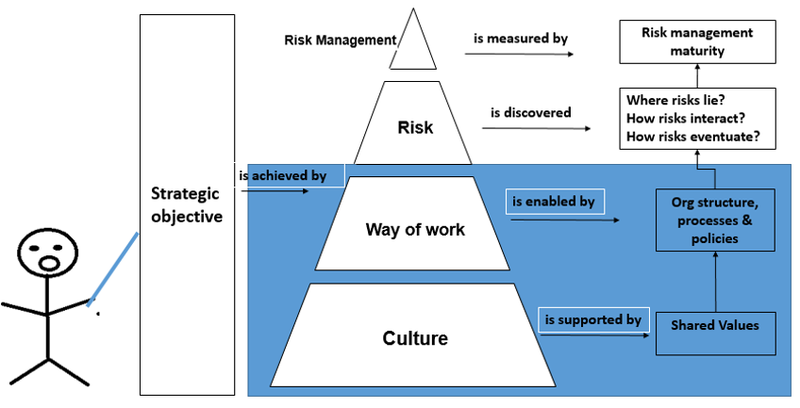 Education of ‘agile way of working’ through a risk lens. A better understanding will lead to better acceptance for change. I was surely confused with jargons like lean, kata, Kanban, test-driven development and feature toggles and why the team believes ‘wall walks’ is better than a ‘status report’? Providing people who came from an established environment with a risk assessment of ‘going agile’. An objective and independent assessment on how key attributes such as cost, time and quality can be managed in an agile environment? Why is it ok for project team to not commit to a deadline until much later into the project? A risk assessment on how the transition as a project can impact and deliver value to the company. Informing a decision on the necessary investment in resources, people skills and organisational restructuring to maximise the values of ‘going agile’? Leveraging risk knowledge in current process and practice to identify ‘best value’ opportunity for agile adoption. Being an agile champion and a catalyst for incremental changes. Highlighting the positive risks associated with agile and the risks of inaction. Do what risk managers do best naturally in promoting a collaborative culture that values trust, transparency and challenging status quo. 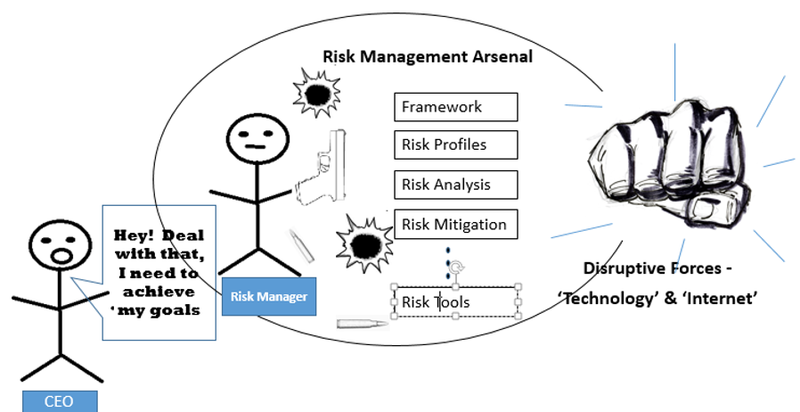 Providing management comfort over key risk areas that conventional risk information would otherwise not be available. Particularly for C-suite executives who usually came from a traditional setting. Gone are hefty business cases, periodic status reports and approval gates, replaced with risk insights from stand-ups, wall walks, demos and retrospective reviews. Qualitative risk assessment in this high velocity environment where emphasis is skewed toward stakeholder feedback that is mostly subjective? Visual risk representation such as risk burn-down chart would bridge the communication between project teams and business stakeholders. Contributing to the management of the most important asset – people. Devs, Agile coaches, BAs, Product owners and senior management. How best to recruit, retain, develop and grow people in an evolving environment? How to facilitate, promote and build a culture that is conducive to agile philosophy? Providing risk support to the management of operational risks associated with ever moving structure and elevated autonomy. For instance proliferated user access management, IT change management (DevOps), security and availability risk consideration within the development lifecycle, incident response and problem management. In true agile fashion, risk managers, irrespective of the industry or the disruptive journey the company is at, must also be digital-ready and agile – trial and error, explore and continuously improvement to stay relevant and add value. What is your experience?